Discussion in 'Kontakt' started by Introninja, Jun 11, 2014. Now in the "Find What" Box Type: New letters & numbers you will use Example like "c12"
Now in the "Find What" Box Type: New K2lib code you will use Example like "K2lib0909"
I know how to use find function. And I know how to find nicnt numbers. But I never connected the dots like that to use it as an info tool like that! Good stuff mang! Thank you, I only deal with snpid when I tried to use the nicnt of Vienna Chanber Strings Viola on the others Instruments. Simply opened the archive with notepad++ and erased Viola and typed Cello. Then replaced the numbers of the snpid. It worked. But this way it could clash with other numbers and I would be forced to use the "try and error" method or whatever "prueba y error" could be spoken in English. Thank you again. Clear as allways. do you know how to do this on a mac? Into these files there is a alphanumeric data that identify them uniquely, this data is called SNPID. So in short, SNPID is the data that identify each library for Kontakt. What you can do with it is create your own nicnt file to add a library to Kontakt library tab with its own wallpaper and so. The problem with the methods, described before is that not only Kontakt libraries have a SNPID. For example Solid Bus Comp have a SNPID too, and an XML file into the Service Center folder, witch will appear when you'll do the search, but is not taken in account by Kontakt. Even though, it's a good approximation. Valid range of alphabetic characters: a to f.
Individual registration number of the library should not consist of only numeric combination. If the registration code you choose for a library already exist, kontakt will tell that the library already exist. Perfect, I was just wondering about this. Thanks. + List any stored SNPID entry at your System \ inside any *.xml-file! 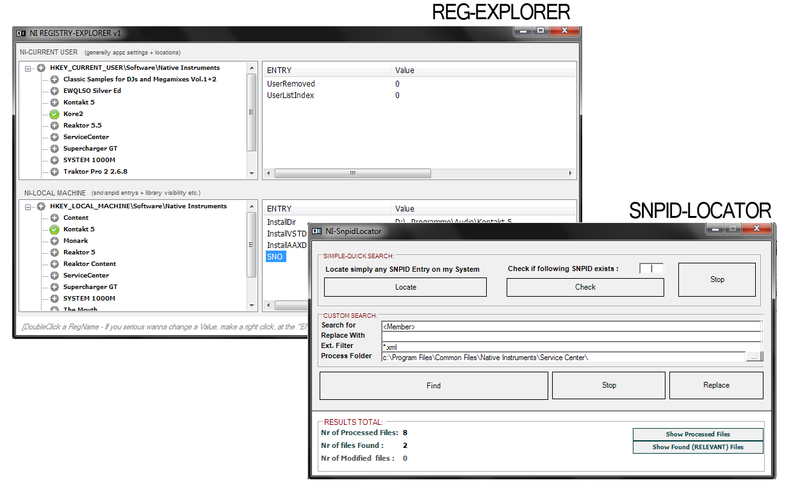 Simply shows any NI-Reg related, and if wanted: you also can change values, exactly: point this tool (with a right-mouse click at the "ENTRY" Tab) into your real Systems-Reg. (I use for Reg-entrys TotalCommander Addons and made shortlinks to my Fav's for such Job, but i think there are some out there who still again and again open the Reg by the commandline in windows for NI related... if "YOU" agree: save lifetime -> this is yours! I used Introninja's suggestion: Text Wrangler. Worked like a charm. I used it to compile the numbers and add new ones for my own list. I'll thank you, now. Your info is crazy helpful. You are much appreciated! Fanatstic... ive been looking for how to this for awhile! Introninja, Olymoon, Tracer...wow, a proud day here around here at AusioSex when so much time and effort is spent mentoring sisters and brothers, imparting your wisdom and sharing your joy. COMMUNITY...somebody, can I have a witness!!! Do you have a similar application for mac? Wow thanks for so much info! From Kontakt version 1, I've always drag and drop samples to a blank instrument. But after finding you guys I'm going to give this a try! So if I understand this post correctly I only need to be concerned with the SNPID of my Kontakt Libraries? and not the SNPID of exp VC-160, Guitar Rig etc? Any help or tips is greatly appreciated! I registered over 800 Kontakt libraries since I learnt how to create my own NICNT files. And with the last utility found by the friend NYCGRIFF all of my libraries will be registered with the NICNT file. Thanks forever to him. From 1600 libraries there were 21 that didn´t want to register and with this last utility found by NYCGRIFF I can register ALL of them.